"A healthy and tasty chicken. You can always add more or different seasonings to your taste." Preheat oven to 375 degrees F (190 degrees C). Line a baking sheet with aluminum foil. 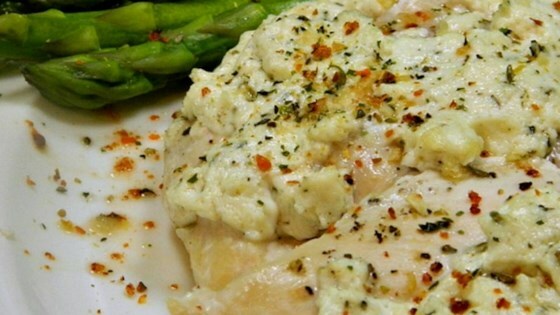 Place chicken breasts on prepared baking sheet. Stir goat cheese, parsley, garlic, thyme, oregano, and salt together in a small bowl. Bake chicken in the preheated oven for 15 minutes. Spread goat cheese mixture over the top of each breast and continue to cook until no longer pink in the center and the juices run clear, about 5 to 10 minutes more. An instant-read thermometer inserted into the center should read at least 165 degrees F (74 degrees C). Absolutely delish!!! Didn't change a thing and my family loved it!!!!! Super easy and tasty! Only recommendation is to stuff the chicken with the goat cheese instead of putting it on top.